First of all, I want to wish Happy Holidays to all of my readers! May you and your families and fuzzies enjoy this wonderful time of year! For the most part, my family and I enjoyed a fun and relaxing Christmas weekend. Food was delicious, catching up with family and friends was a real treat, and Santa (embodied by family) was very generous. However, Christmas dinner came to a screeching halt just before dessert – one of our dogs (Lucy) got into a fight with one of my parents’ dogs (Goldie). A serious fight. They’ve been friends and “cousins” for years and love playing with each other. The rare tizzy has been broken up with a stern word or, at most, a nudge to the ribs with one’s shin. But this was different. It was scary. Lucy was fetching a ball while Goldie was goading her into playful wrestling. It appears Lucy got territorial about the ball and started the fight. I’ll be honest – it was one of the longest, dreadful moments of my life. Snarling, barking, squealing – they went after each other’s necks, then legs, then faces. They literally latched on to each others’ faces and I thought they were each going to lose an eye. There was blood all over their faces, necks, chests, legs. My husband jumped to the rescue – first shouting, then a shin kick, then a bigger kick to each dog. Then grabbing by the scruff/collar, then punching and kicking both dogs. It was a horrible sight – watching dogs hurt each other and get hurt by their loving Rick. But neither would let go. I grabbed the other dog – one hand on the scruff/collar, the other around the torso – both dogs were in mine and rick’s arms, but we could not get them to detach from each others’ faces. Someone from the party shouted “grab ’em by the groins!” so I reached down, but before I could grab down there, the dogs let each other go. We separated them and made them sit to assess the damage. Goldie on the left, Lucy on the right. Cute and snuggly 99.9999% of the time. Both dogs and my husband ended up in the emergency room. Christmas night. (God Bless all the doctors, nurses, and vets who work on holidays!!) The dogs each got a severe cut to a leg that required staples, plus some other punctures and cuts that required cutting the hair back and cleaning. Rick got a puncture to the palm and some bite cuts to both hands and arms. All in all, we feel so lucky that it wasn’t worse. But I’m still a bit shaken from the experience. And so is Rick. Lucy on the ground (Levi on the chair) to show Lucy’s size. These dogs each weigh about 45 lbs. So, not small dogs, but certainly not large. 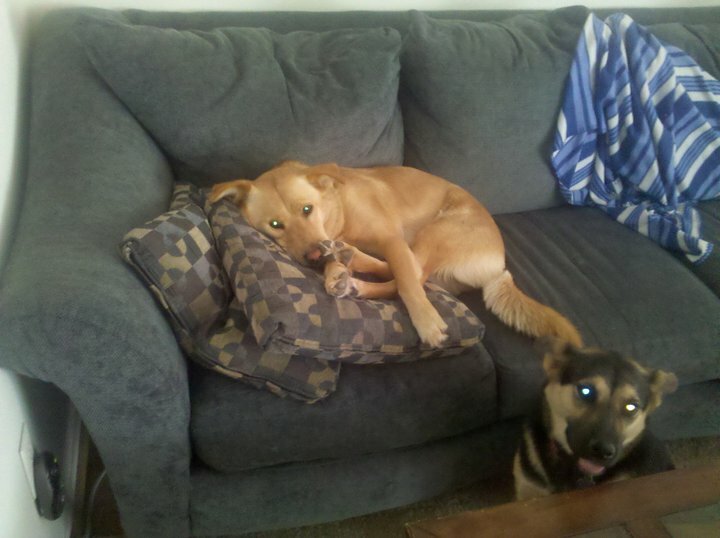 Goldie is a lab mix, and Lucy is a mini German Shepherd. It took all our combined strength to handle them, all pumped with adrenaline. Could you imagine if these were 60, 80, or 100+ lb dogs? Having never witnessed, let alone intervene, in a dog fight this serious, we came away realizing that we needed to do some homework on this issue. So, as a public service announcement, allow me to share some of my research on how to deal with a dog fight. If you have two people, each person approach a dog from the rear, and grab their back thighs, lifting their rear legs off the ground. It may take a moment, but this will force them to let go as they have no forward purchase/support. Then, in “wheelbarrow” stance, move backwards and also circle around – this prevents them from sharply turning their body to bite you – it forces them to keep their front legs moving, or else fall on their face. You can do this move even if one dog is on its back: drag them around. If you are by yourself, get a leash. Get behind the dog, wrap around their torso and loop through the handle (or use a snap if you have the “police” leash), so that there is a “collar” around their rear loin. Then lift the dog by the back legs, walk backwards, and then secure the end of the leash to a post/door/tree/something immovable. Then go around to the other dog, lift by hind legs, and move backwards and circle. Spray with high-power water hose nozzle. May shock them out of the fight. A bucket of cold water. Same idea. Use a CO2 fire extinguisher and blow them down. May shock them out of the fight, and also blowing on their faces will impede breathing oxygen and force them to separate. Throw a blanket on them. May shock and “quiet” the dogs, but may not. Citrontella spray or pepper spray. In their faces. Several websites mention this as it keeps the human a few feet away, but that sounds like a very last resort to me. Last but not least, do not put your hands anywhere near their faces or necks. Even though that’s where their collars are. Sounds like common sense, but when you’re witnessing your beloved pooch get eaten alive, you’re first instinct might be to get in there and grab what you can! That’s what we did – and we’ve got hundreds of dollars in medical bills to thank for it! Yikes! Glad no one was more seriously injured. Thanks for the tips. Holy cow. What a horrible experience. We have labs (one right now) and they do weigh close to 100 pounds each. 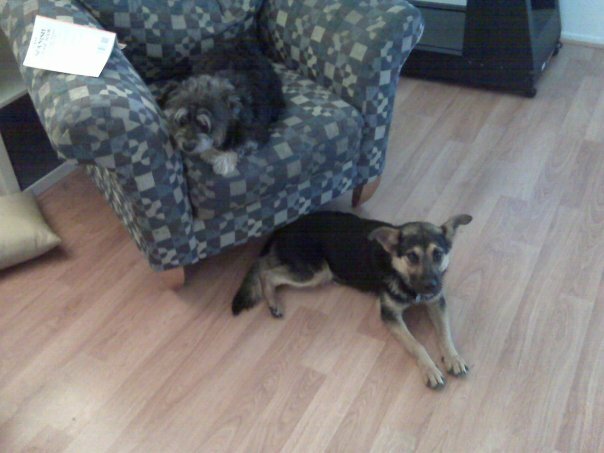 When McGwire, now deceased, was even ten years old, I kept him far away from other dogs as he always showed aggression. I knew I'd never be able to pull him off another dog. Our dogs always play with my in-laws' dog. They've been buddies since puppyhood, but I guess you just never know. Sorry you had to go through that. oh wow, glad no one was seriously injured. Thanks for sharing the tips…never heard of the wheelbarrow move but that sounds like a good one to have in the bank. Thanks for the info… our two females have been fighting lately and it scares the crap our of me! These are good things to know! Hubby and I do pretty much what he said so that is good to know we are on the right track. Sorry for your scare on Christmas… glad the girls and your hubby are ok.
Wow that is scary! My dog is ten pounds and tends to be aggressive towards other dogs (he loves cats though, go figure). Thankfully at ten pounds I can just scoop him up and remove him from the situation. I have two females, roughly the same age and size (now 13-14 years old and about 45 lbs each). They have lived together for nine years now and have had a few serious scuffles. One was also on Christmas day – a fight over a crumb of food that resulted in my Elkhound ripping my Chow mixes eyelid open. She was so lucky not to get her eye. I supervise them closely when there is food around (and did then, too – it was literally one piece of kibble that was missed). A few years later they had a repeat and my Chow mix had to have her eyelid stitched up again. It's made me so nervous about having two dogs ever again, it can just happen so quickly even when they get along 99% of the time. I believe my Elkhound to be a puppy mill puppy with no canine socialization (I got her as a five year old adult) – she has no bite inhibition and even when taking food she will almost take your hand off so there is no “warning nip” from her. I have worked with her a lot on this, and she has finally gotten in the last year where she will growl instead of just snapping out. I do scold her for the growling but she has learned to deescalate from that and turns it into avoidance where she will turn her head away from my other dog. I was warned that two females can be a difficult combo and I have definitely had to learn the hard way. Glad everyone is okay, I know exactly how scary it is!